Eminent Director Late V. Shantaram Marathi movie "PINJRA" was re-released in digital format this year. 31st March 2016 marked 44 years of completion since the movie was first released on the same day in the year 1972. The plot revolves around a respected village school teacher (Dr. Shreeram Lagoo) who falls in love with a travelling dancer (Sandhya) and later faces a moral dilemma. 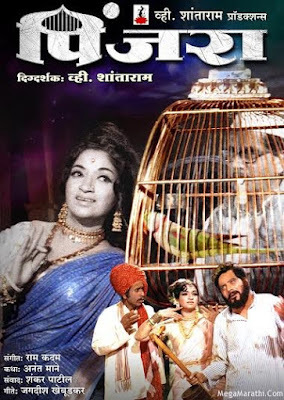 The movie was one of the biggest commercial success of its time and also won the National Film Award for Best Feature Film in Marathi for the year 1972. In my article herewith I won’t delve into the plot or synopsis details of this movie. I would rather focus more on behind the scenes what happened before and during the making of this iconic musical hit Marathi movie “PINJRA”. The whole shoot of the movie was completed in a span of just 40 days then. It was the veteran actor Dr. Shreeram Lagoo who had played the lead role in this movie. Dr. Shreeram Lagoo is well known not as a good film and theatre actor but also holds the reputation of being an eminent ENT Surgeon Gold Medalist. One day post completion of his play there were two individuals who were waiting in the backstage to meet Dr. Shreeram Lagoo. One individual was by the name Ravindra who was in his relations and was working as an Assistant Director to the eminent director Late V. Shantaram then. Other individual was Mr. Anant Mane also a Film Director. Ravindra said to Dr. Shreeram Lagoo, “Anna Saheb (means V. Shantaram) is in the midst of making new Marathi movie. To lead the lead role as an actor we both (Ravindra and Anant Mane) have recommended your name to Anna Saheb to play the lead role in his upcoming movie. As we both have watched several Marathi plays we are positive you would give complete justice to the role that would be offered to you in his upcoming Marathi movie. However, Anna Saheb has not seen you perform till date live on the center stage so we request you at least come down and meet him (Anna Saheb – V. Shantaram) in person”. Hearing this Dr. Shreeram Lagoo said, “It would indeed be a matter of pride for me to meet Anna Saheb (V. Shantaram Ji) an eminent director and a man of such great stature. However, whether I would work or not in his movie shall be decided by me only when I am done reading the script. So first things first you’ll first arrange to send me the script. Let me read it then we can decide when to meet director V. Shantaram Ji”. To which Ravindra replied, “Anna Saheb never discloses his script to anyone before. That’s his style of working”. Pat came the reply from Dr. Shreeram Lagoo, “I too do not accept any roles prior reading the complete script. That’s my style of working”. Both Ravindra and Anant Mane were now looking at each other and totally confused what to do next. Mane said, “Dr. Saheb you see in this line of show business one got to be really very careful when it comes to your script. It’s an accepted fact that good scripts do get stolen. It’s not that we don’t trust you but due to such incidents taking place Anna Saheb has been very particular and stringent about all these issues”. But, Dr. Shreeram Lagoo was upfront and equally firm in his opinion for reading the script first before concluding on anything. Mane realized this and said, “We both would try to bring the script for you to read first. However, the fact that you have read the script before should not be shown or disclosed to Anna Saheb (V. Shantaram Ji) any time during the course of your meeting with him”. This assurance from both Ravindra and Anant Mane brought smile on the face of Dr. ShreeramLagoo. He felt, “If I like the script there is no harm in going ahead. However, if I don’t like the script at least I get the opportunity to meet this legendary director V. Shantaram Ji”. The script was indeed well written and Dr. Shreeram Lagoo felt it gels well keeping his age in mind and his role that of respected village school teacher who later falls in love with the travelling dancer. Title of the movie was “PINJRA”. Finally the day came when the meeting was finalized between Dr. Shreeram Lagoo and Director of the movie Late V. Shantaram. Venue was Mumbai’s iconic RajKamal Studio where the legend had his office. RajKamal studio in Parel was the same studio where superstar Mr. Amitabh Bachchan had shot many important sequences for his blockbuster movie 'Deewar' which includes “Khush To Bhaut Hoge Tum”, “Mere Paas Maa Hai” and death sequence. Rajkamal was best known for Dr. Kotnis Ki Amar Kahani (1946), Amar Bhoopali (1951), Jhanak Jhanak Payal Baaje (1955) and Do Aankhen Barah Haath (1957). The meeting was very cordial they did not discuss anything related to the movie script. 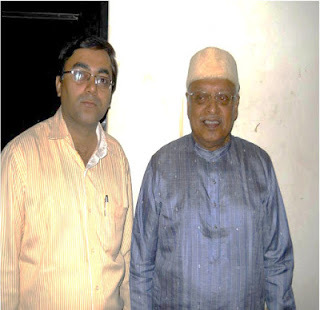 Anna Saheb was curious to know more about Dr. Shreeram Lagoo’s work in the Marathi play “Natsamrat” and who was the writer who had written the script etc. Anna Saheb would always be interested to know the person whom he meets is just interested in his work or is also abreast about surrounding events and happenings. That was exactly he wanted to judge from Dr. Shreeram Lagoo when he asked him the author’s name and who is he who had penned down the script of Natsamrat. The meeting lasted for around 45 minutes and Anna Saheb concluded it by saying, “Dr. Saheb you would work in this project. Other details would be communicated to you by my team members Ravindra and Anant Mane”. It was communicated to Dr. Shreeram Lagoo the shooting of the movie would commence next month and would be completed in a span of forty days. Most of the projects by Anna Saheb (V. Shantaram) were always completed in forty days’ time frame at a stretch. The time frame made Dr. Shreeram Lagoo bit apprehensive as he was ferociously busy and booked with dates for three different Marathi plays from three different producers. These dates had already kept him busy for next sixty days. He had never worked in Marathi movies so to commit forty days for his first project “PINJRA” made him all the more nervous. It was like either you accept one project here and reject the ongoing three Marathi plays. Anant Mane went and spoke to Anna Saheb regards the busy schedule of Dr. Shreeram Lagoo. Finally the agreement was Dr. Lagoo would give ten days per month for the next four months to complete his schedule of forty days. When asked for commercials to be charged Dr. Shreeram Lagoo being novice in the Marathi Film and this being his first project was also not sure how much to quote. All he knew was while acting in movies the remuneration was much more in comparison to Marathi plays. He also knew the remuneration was much higher in Hindi movies but this was his project to be done in Marathi. Those days in early 70’s Dr. Shreeram Lagoo used to get Rs 150/- per live performance. He used to perform at least one live Marathi play per day. So shooting for “PINJRA” for forty days would equate to Rs 6000/- is the remuneration Dr. Shreeram Lagoo asked for. Rupees six thousand was indeed a very high amount to be commanded and asked for especially this being Marathi movie. The final price communicated was Rs 2,500/- to Dr. Shreeram Lagoo reason even in those days (1971) the main cameraman from Rajkamal Studio was paid Rs 300 per month. Also, this being Dr. Shreeram Lagoo’s first project in Marathi movies an amount worth Rs 2,500/- was justified right is what Anna Saheb and his team members Ravindra and Anant Mane felt. The whole shoot of the movie “PINJRA’ was done in Maharashtra Kolhapur and the nearby villages out there. Once famous studio “Shalini” out there was purchased by Late V. Shantaram and was named as “ShanthKiran Studios”. Which sequence would be shot the next day and where all these details were disclosed to the whole crew at least one day prior. One day when Dr. Shreeram Lagoo reached the sets early morning he saw all the crew members part of this project were exhibiting nervousness. Investigation revealed that a night before robbery had taken place at the studio. All the costumes and belongings that were part of the project were robbed overnight. Now to get new dress stitched once again would mean a delay of at least 4-5 days which means the schedule of forty days (ten days per month) would definitely get extended. This thought made Dr. Shreeram Lagoo more nervous as he knew his busy schedule for the next six months. How and when now would he be able to meet his commitment for forty days is what kept him thinking all the time. Dot on time 9 am Anna Saheb (V. Shantaram) came at the shooting venue on learning of this incident he later said, “Let’s first get all the clothes stitched again today for those whose shooting was scheduled today. Then step by step let the tailor stitch the clothes as per rest of the shooting schedule. Let’s put in few extra hours daily for next few days for whatever time we lost today. Let’s not forget Dr. Saheb (Dr. Shreeram Lagoo) needs to be released in ten days timeframe with no further delay as was agreed earlier”. Hearing this Dr. Shreeram Lagoo was not only speechless but his level of respect towards Anna Saheb (V. Shantaram) increased ten folds on hearing this. That was the mark of this man in great stature the eminent director Late V. Shantaram – The Man Who Altered the Course of Indian Cinema. The classic Marathi Film "PINJRA" remains to be one of Indian Cinema's greatest cinematic achievements even today. And for those who missed it there is always another opportunity to watch it once again which got re-released in the digital format.